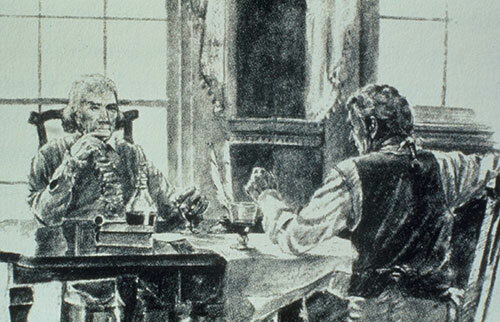 Painting of President Thomas Jefferson in the Lewis and Clark Slide Program. Courtesy of the National Park Service. 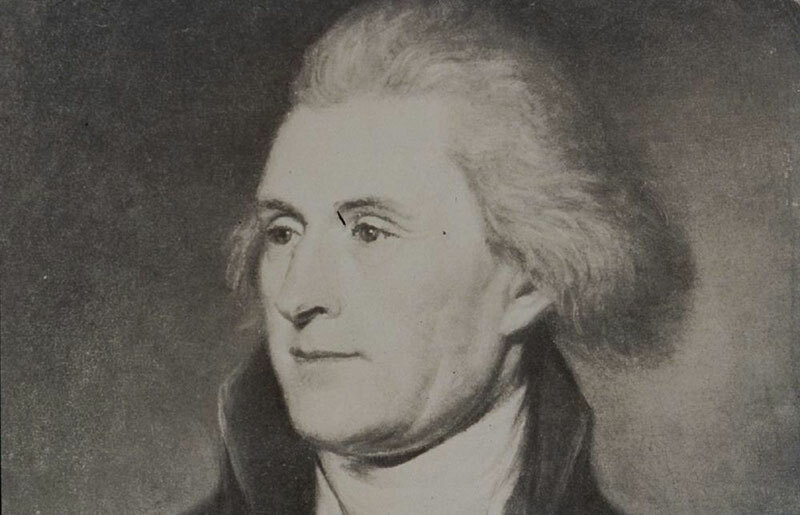 Thomas Jefferson (1743-1826), one of the Founding Fathers of the United States and author of the Declaration of Independence and the Statute of Virginia for Religious Freedom, founder of the University of Virginia and America’s third President (1801–1809). A proponent of democracy, republicanism, and individual rights, he motivated American colonists to break from Great Britain and form a new nation, he produced formative documents and nation-building decisions. Born in 1743 in Albemarle County, Virginia, inheriting from his father, a planter and surveyor, some 5,000 acres of land, and from his mother, a Randolph, high social standing. He studied at the College of William and Mary, then read law. In 1772 he married Martha Wayles Skelton, a widow, and took her to live in his partly constructed mountaintop home, Monticello. 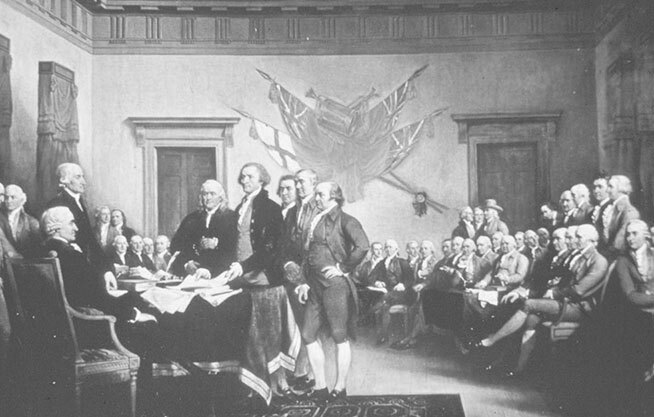 Signing the Declaration of Independence. Courtesy of the National Park Service. Jefferson briefly practiced law, at times defending slaves seeking their freedom. During the American Revolution, he represented Virginia in the Continental Congress that adopted the Declaration, drafted the law for religious freedom as a Virginia legislator, and served as a wartime governor (1779–1781). He succeeded Benjamin Franklin as United States Minister to France in May 1785, and subsequently the nation's first Secretary of State in 1790–1793 under President George Washington. Jefferson was sworn in as the third President of The United States of America on March 4, 1801; he was the first president to hold his inauguration in Washington, D.C. (George Washington was inaugurated in New York in 1789; in 1793, he was sworn into office in Philadelphia, as was his successor, John Adams, in 1797.) Jefferson broke with tradition and walked to and from the ceremony instead of riding a horse drawn carriage as Washington and Adams did. One of the most significant achievements of Jefferson’s first administration was the purchase of the Louisiana Territory from France for $15 million in 1803. At more than 820,000 square miles, the acquisition (which included lands extending between the Mississippi River and the Rocky Mountains and the Gulf of Mexico to present-day Canada) effectively doubled the size of the United States. Jefferson then commissioned Meriwether Lewis and William Clark to explore the uncharted land, plus the area beyond, out to the Pacific Ocean. (At the time, most Americans lived within 50 miles of the Atlantic Ocean). The expedition, known today as the Corps of Discovery, lasted from 1804 to 1806 and provided valuable information about the geography, American Indian tribes and animal and plant life of the western part of the continent. Jefferson expected further westward settlements due to the Louisiana Purchase and arranged for the exploration and mapping of the uncharted territory. He sought to establish a U.S. claim ahead of competing for European interests and to find the rumored Northwest Passage. Jefferson appointed Meriwether Lewis and William Clark to be leaders of the Corps of Discovery (1803–1806). Jefferson tutored Lewis in the sciences of mapping, botany, natural history, mineralogy, and astronomy and navigation. Lewis was given unrestricted access to the library at Monticello, which included the largest collection of books in the world on the subject of the geography and natural history of the North American continent. To this day Thomas Jefferson still ranks highly among U.S. presidents; Presidential scholars and historians generally praise Jefferson's public achievements, including his primary authorship of the Declaration of Independence, advocacy of religious freedom and tolerance in Virginia, and his oversight of the Louisiana Purchase. "The care of human life and happiness, and not their destruction, is the first and only object of good government. "